And that was that. 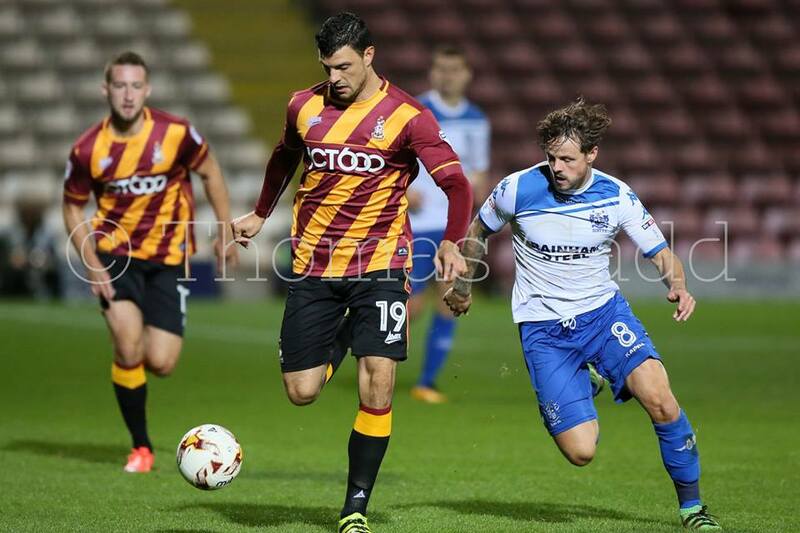 As Timothée Dieng twisted from the centre circle and Jordy Hiwula sashayed down the right, the qualities that have marked the first two months of Stuart McCall’s second spell at the Bradford City helm were once again on display for a grand total of 1,865 people to see. Hiwula receives the ball, turns out and adroitly threads a pass to the onrushing Haris Vučkić, who meets the ball with a thumping finish angled beyond Ben Williams from close range. This was business as usual from a City side whose concerted purpose continues to stun, but their typical flair was teamed with a gnarlier edge that saw Hiwula repeatedly slash at the visitors. On the surface, the national media will not have to work too hard to fit this game into the narrative of contempt and indifference overarching the smugness of these reforms. City swapped out Colin Doyle for Rouven Sattelmaier after three minutes, Doyle chuckling as he left the pitch to an ironic standing ovation. They filled just three spots on the bench, Tom Windle and Kwame Boateng the only two substitutions remaining after the inevitable goalkeeper switch. Bury chief David Flitcroft cracked jokes with the City fans directly behind the dugout, laughing off a handball appeal with the line, “But he only used one hand!” Couple all that with the painfully low attendance and the bylines will write themselves. If there was an air of markedly lowered expectations, neither side approached this endeavour with contempt. Judged objectively, aside from the uproar, angst and apathy that will inevitably dominate the discourse tomorrow in view of universally plummeting attendances, this was, again, a worthwhile enough workout. Kenny Black approached this cannily: for a squad of City’s depth, still hounding that final piece of the jigsaw, they were always going to benefit from an exercise where not even their dignity was at risk. These reforms are still ill advised, still condescending, still poorly constructed, still worthy of the backlash that has waged on and on tonight – but Bury were no pushovers, and City met the visitors’ panache with equal guile in a tightly-fought and combative contest. There were starts for McArdle, Clarke, Killgallon, Rabiega, Morais and Devine; Haris Vučkić would play the auxiliary striker to Jordy Hiwula, and former City men Greg Leigh and Ben Williams both featured for the visitors. They had their shaky moments at times, but looked sharper in the final third than they have all season. If Billy Clarke was an early trailblazer for McCall’s methods, he must at least acknowledge the pedigree of the competition that Vučkić presents. His partnership with Hiwula was startlingly cohesive in the first half, Vučkić’s natural intelligence and ambition complementing a Hiwula who is learning to underline a striker’s instinct with a more disciplined reading of the game. At times, Hiwula played with an urgency not seen since the days of Nahki Wells, scavenging loose balls, running with a fluency that could struck out half the opposition midfield. Bringing down a hooked ball from the left flank, Vučkić turned to find Hiwula for a goal as well taken as the first. Like Clarke, Vučkić is a technician; his influence dulled in the second half, but he ran the number ten position with alluring fluency. The intensity was obvious, but certainly well channelled. Dieng and Devine were the key driving forces in City’s slickly oiled engine room and purred on with their trademark composure and grit; substitute Boateng initially lacked Dieng’s presence, but toiled under the stewardship of the precocious Devine. Devine ran the show at times with his trademark nonchalance, a feat impressive apart from the fact that he is just 19. The tempo admittedly stuttered into fits and starts in the second half, both sides fluid but favouring an approach closer to abandon. At times, Bury came within touching distance of a leveller, Andrew Tutte pickpocketing Morais on the right to fire narrowly over; minutes earlier, City had conspired to lose possession deep on the right flank and Tom Walker capitalised with a well-drilled finish. If this was the game in which City looked more likely to score than ever before, they also looked more likely to concede – there were few glaring defensive weaknesses, and Killgallon in particular looked handy, but Bury carried a potent threat of their own and looked keen to restore parity. Rory McArdle looked to lack match sharpness, but grew as the game wore on. If there was an awareness the stakes were notably lowered, it did not manifest itself in a lax on-field display. This was an engrossing spectacle aside from the fact that Cheltenham VS Everton U21s and Wycombe VS West Ham U21s were also taking place at the same time. The intensity here was aligned closely enough to a league game, and the visit of Bury in the league in December will most likely yield a similar outcome. City continue to look smarter and smarter, and tonight’s disciplined display should serve only to bring them closer to ironing out that final infamous crease. Once again there will be the critics of the competition but, for us, it’s very worthy and gives players much needed match time and the chance for new partnerships (Hiwula & Vuckic, for example) to be tested. I thought it was an entertaining game and the momentum keeps going. Devine, Dieng, Vuckic and Hiwula all stood out for me in this game. Devine may well have played himself into Saturday’s team to replace Cullen. The defence was solid but inevitably it got scrappy when those two young lads came on. I boycotted the U23 match but was happy to show up for a game against an actual football club. I enjoyed the game, and the win virtually guarantees we go through to the next round (Morecambe need to bet us by 2 clear goals, and Bury beat Stoke, for us to finish third). We are also £20,000 better off for the two wins so far. Anyone going to the Morecambe game? Went last night on a whim, first game I’ve attended since Parky left as I usually have to rely on WOAP’s excellent articles for my City news. The thing that stands out for me this season is that no player is scared of the ball. When we had Colin Todd back in the dark old days players would be terrified of taking responsibility and would panic like rabbits in headlights when they got it. Last night it seemed every single player on the pitch wanted the ball and wanted to make things happen which was encouraging, although I feel the changes to the starting XI inevitably disrupted our fluidity (not a criticism at all, it had to be done and was the right decision). Vuckic looked good if a bit slow compared to the rest of the offensive unit, however if we have him dictating play through the middle this shouldnt be an issue with our pace in other areas. Some of the passes he sprayed about were great. Hiwula looked decent but again I feel he can still improve, this will surely come with more game time though. Rabiega didn’t do anything for me beyond a few nice touches but he was out of position so I wont read too much into that tbh. Back line was solid all night, went to sleep for the goal but beyond that dealt with everything Bury had pretty comfortably. I felt for Boateng as we lost the midfield totally as a result of him coming on, cant fault him for effort/passion at all but I felt his touch wasnt good enough and he was almost trying too hard at times. And THIS is why i vote for WOAP in the blog awards. I was there my kidz. Sitting on the front row by the centre line (a privilege we don’t get on a league match day), we enjoyed the pace, drama & action. Close up, Timothee Dieng was a revelation and i see why he’s a core part of the first team. I agree that Devine looked at home & will go far. It was like breathing fresh air after a day in the office watching McArdle back in action. Reluctantly i agree on comments above on Rubiega, albiet he played with passion and energy. My kidz thought he was great. My youngest also agreed to be photographed with Billy Bantam. And he doesn’t get enough credit for BCFC’s renaissance.